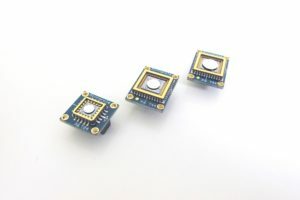 MEMS Mirrors | Mirrorcle Technologies Inc.
Scanning two axis (tip-tilt) MEMS mirror (or “micromirror”) is an optical beam-steering (or 2D optical scanning) technology that is used in many industries. There are several major benefits of the Mirrorcle Technologies Inc. tip-tilt MEMS mirror over competing products. Gimbal-less Two-Axis Scanning Micromirror Devices based on ARI-MEMS fabrication technology initially developed through research projects based on ARI-MEMS fabrication technology at the Adriatic Research Institute (“ARI”) in Berkeley, CA, the Gimbal-less Two-Axis Scanning Micromirror Devices operates in ultra low power environments and provides very rapid optical beam scanning in two axes. The devices deflect laser beams to optical scanning angles of up to 32° at high speeds in both axes. Compared to existing large-scale galvanometer optical scanners, our devices require several orders of magnitude less driving power. A continuous full-speed operation of our electro-static actuators dissipates less than a few milliwatts of power. MirrorcleTech devices are made entirely of single-crystal silicon, resulting in excellent repeatability and reliability. Optically flat and smooth mirrors are coated with a thin film with desired reflectivity. Larger mirrors can be bonded onto actuators for custom aperture sizes. Mirror sizes from 0.8mm to 7.5mm in diameter are currently available in stock. Sizes up to 9.0mm were successfully demonstrated in special applications. 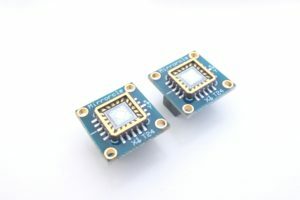 MirrorcleTech’s MEMS micromirror technology is highly versatile and adaptable to various applications. Some devices are fabricated with somewhat generic quasi-static (point-to-point) performance specifications. Other devices are highly customizable to achieve specific set of specifications, such as e.g. projection-displays. While the descriptions below mainly pertain to dual-axis devices, there are also multiple single-axis designs available, both point-to-point (quasi-static) and resonant type. Mirror Sizes: 0.8 mm, 1.2mm, 1.6mm, 2.0mm, and 2.4mm diameter in stock. Maximum tilt angle under point-to-point driving:-6° to +6° mechanical each axis, varies with design type. Single-Axis Option: Most designs can be provided arranged for pure single-axis motion. Bonded Mirror Sizes: 2.0, 2.4, 3.0, 3.6, 4.2, 4.6mm, and 5.0mm, 6.4mm, and 7.5mm diameter in stock. Maximum tilt angle under point-to-point driving: -6° to +6° mechanical on each axis, varies with design type, and in some cases is limited by mirror size. Maximum tilt angle under resonant driving: -7° to +7° mechanical, in some cases limited by mirror size. Single-Axis Option: In-stock single-axis actuators can be combined with many of the available mirror sizes. Optical Window: Anti-reflection coated fused silica windows. Removable. *Customer Specific wavelengths and AOI available for quantities above 100 units. Optical power handling: up to 2W any mirror, any wavelength. Above 2W depends on mirror size, coating, and wavelength. E.g. 3W CW blue or green on a 2mm or larger mirror. First resonant rotation frequency: >3 kHz for both axes for small mirror sizes, >1.2kHz for 2.0mm size, etc. View price list (in PDF) for prototyping and low-volume quantities. *Mirrorcle Technologies’ Terms and Conditions of Sale apply. Please contact us for additional product details, custom device specifications, and large-quanity quotations. MirrorcleTech devices are highly customizable with several controllable trade-offs (mirror size vs. speed, angle vs. speed, die size vs. speed, die size vs. cost, etc.) Custom designs and fabrication is performed for larger orders or under NRE contracts. This is the key differentiation with digital micromirror elements which can not be used for arbitrary-direction optical beam steering. In other words, if a tilt angle of 6.15° is required, it is simply a matter of applying the correct voltage and that angle (or any other angle) can be obtained and maintained for any length of time with nearly zero power consumption. The devices are designed and optimized for point-to-point optical beam scanning mode of operation. A steady-state analog actuation voltage results in a steady-stage analog angle of rotation of the micromirror. There is a one-to-one correspondence of voltages and angles that is highly repeatable. A number of resonant-type scanning MEMS mirror designs is also offered for video projection and high rate imaging at e.g. 48000 lines/s. Devices can also operate in the dynamic, resonant mode. In this mode, low actuation voltages at frequencies near resonance result in large bi-directional optical beam angles (e.g. -16° to 16°). Resonant frequencies are in the range from several kHz up to 24 kHz and higher for MEMS display applications. Resonance depends on the actuator type (series,) and the micromirror type and diameter. The major advantage of our proprietary gimbal-less design is the capability to scan optical beams at equally high speeds in both axes. A typical device with a 0.8 mm diameter-sized micromirror achieves angular beam scanning of up to 500 rad/s and has first resonant frequency in both axes at approximately 4 kHz. Large angle step response settling times of <100 µs have been demonstrated on devices with micromirrors up to 0.8 mm in diameter. Devices with 2.0mm diameter mirrors can achieve large angle step settling times of <1ms, with first resonance of approximately 1.3 kHz. In order to produce devices with a different mirror size, most technologies require not only a new fabrication cycle, but in some cases complete actuator redesign. Mirrorcle Technologies is the world’s only provider of a MEMS based, customizable aperture size beam steering technology. Namely, sets of electrostatic actuators optimized for speed, angle, area footprint or resonant driving are designed and realized in a self-aligned silicon fabrication process. Metallized, ultra low-inertia single crystal mirrors made stiff and flat by a special design of silicon beams are created in a separate fabrication process. The diameter, as well as geometry of the mirror is selected specific to a given application, in order to optimize the trade-offs between speed, beam size, and scan angle. The mirrors are subsequently bonded to the actuators. A variety of gibmal-less two-axis actuator designs are available. The actuators lend themselves inherently to a modular design approach. Each actuator can utilize rotators of arbitrary length, arbitrarily stiff linkages, and arbitrarily positioned mechanical rotation transformers. In stock categories include 4.25mm x 4.25mm die size, 5.2mm x 5.2mm die size, and 7.25mm x 7.25mm die size. In most cases, larger die size allows better performance due to increased electrostatic force. Beyond die size other parameters are varied such as e.g. stiffness. One device series for example is designed to operate at large angles (-7.5° to +7.5° of mechanical tilt,) while another series is designed to operate at small tip-tilt angles but dramatically higher speeds (-1.0° to +1.0° of mechanical tilt).